Schefflera (Schefflera actinophylla) is an evergreen tree growing 6-10 m tall. It is widely grown in an indoor ornamental houseplant. It has palmately compound medium green leaves in groups of seven leaflets. It is usually multi-trunked, and the blooms are borne in large branched clusters at the top of the plant. Each blossom cluster has several branches up to 80 cm long that radiate outward from a central point. The small bright red blossoms are grouped together in small clusters along these flowering branches. Each flower usually has 12 petals that are pink to red in color and only 3-5 mm long, while its sepals are reduced to a tiny rim. The flowers have the same number of stamens as petals. Flowering occurs mostly during spring and summer. The small fruit turns dark red or dark purple in color as they mature. The umbrella tree generates oxygen, adds humidity and purifies the air. It is popular as an indoor bonsai. Common Names: Australia umbrella tree, Queensland umbrella tree, octopus tree and amate. It prefers partial sun to partial shade. Direct sunlight can cause the leaves to burn. Turn plant occasionally in front of the window to encourage even growth. A peat moss based potting mix with 2 parts peat moss and 1 part perlite is suggested. The pH value should be slightly acidic and should be between 6.0 and 6.5. It thrives well in average room temperatures between 60 – 75°F / 15 – 24°C but no lower than 55 °F / 13°C or higher than 75°F / 24°C. Avoid sudden temperature drops and cold drafts. Water regularly in spring and summer but allow the top inch of soil to dry out between waterings. Yellow leaves are a sign of overwatering. Drooping leaves usually indicate that the soil is too dry. Fertilize every month during the growing season with a balanced liquid fertilizer diluted by half. Reduce the fertilization to once a month during the winter rest period or when the tree isn’t actively growing. Schefflera can be propagated by semi-hardwood cuttings or by air layering. Take stem tip cuttings in spring and summer. It can also be propagated from seeds. 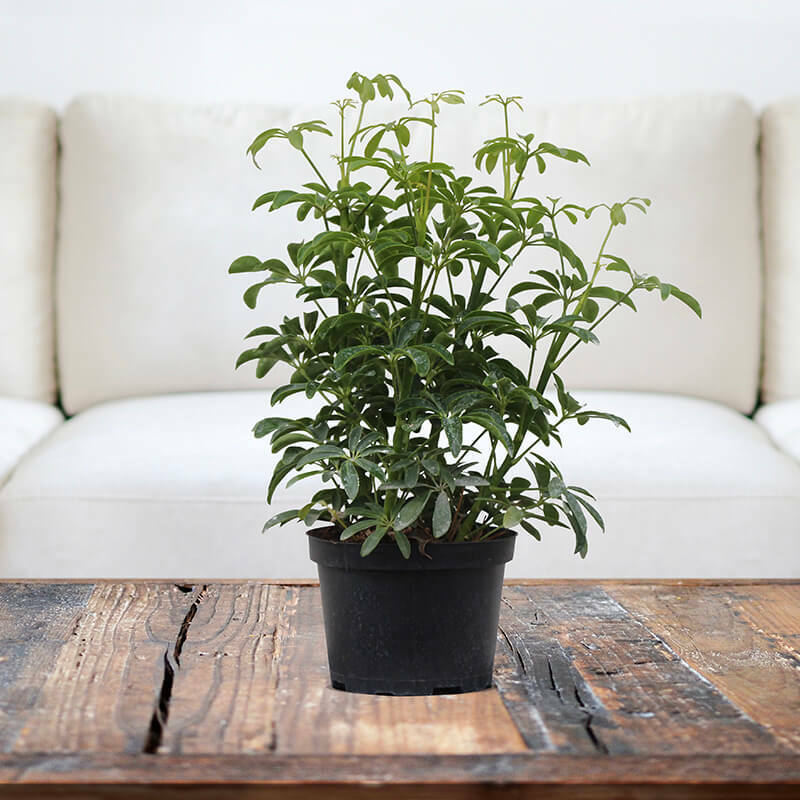 Prune the Schefflera plant regularly to keep the plant bushy. Use sharp scissors or bypass hand pruners to cut the stems right above a leaf. New growth appears directly below where you cut the stem, so try to prune above a stem node. Re-pot the plant once every 2 years, as the plant becomes root bound. 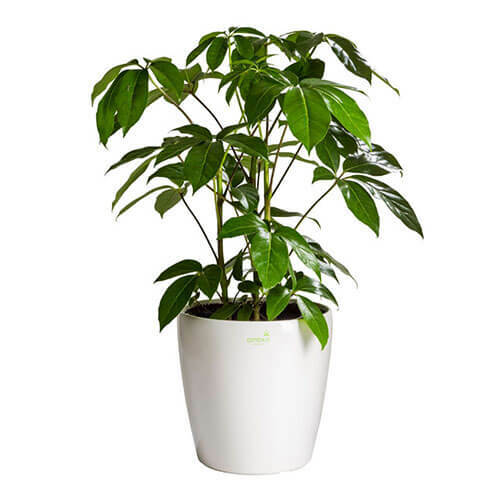 Schefflera has no serious Pest and disease problem. Watch for mealybugs, aphids, thrips and spider mites, thrips. Leaves will drop if soils become too moist or too dry.